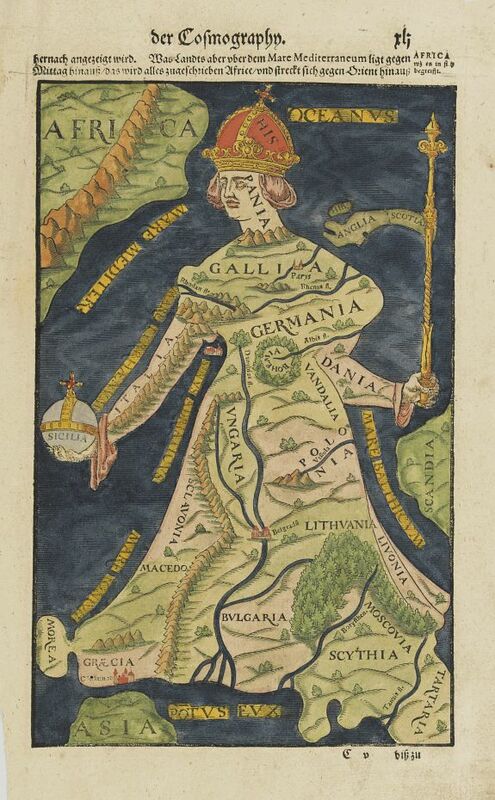 [Europe depicted as a Queen] - MÜNSTER,S. Title : [Europe depicted as a Queen]. Size : 10.1 x 6.5 inches. / 25.7 x 16.4 cm. Colouring : Coloured wood block map. HISPANIA (Spain) is shown in the figure's crown in acknowledgement of its dominance. GALLIA (France) is the upper chest. GERMANIA is the bosom. ITALIA is Europe?s right arm, with SICILIA being the globus cruciger, the cross-bearing orb signifying world power throughout the Middle Ages. BOHEMIA (the Czech lands) is a circular area close to Europe?s stomach. LITHVANIA must be about the spot of Europe?s left knee. LIVONIA, MACEDONIA , BVLGARIA, MOSCOVIA, MOREA (the mediaeval name for the Peloponnese peninsula), GRAECIA, SCYTHIA (present-day Bulgaria), TARTARIA (parts of present-day Russia) are folds ever further down Europe?s flowing red dress. MMC No.1 "Geographical Oddities"., item 6.